I don't know how many of you watch Pretty Little Liars, but that show and The Lying Game are enough to drive anybody insane (in the best way possible). I am going to start posting reviews and theories of both of those shows on my blog so I can share my thoughts with others. 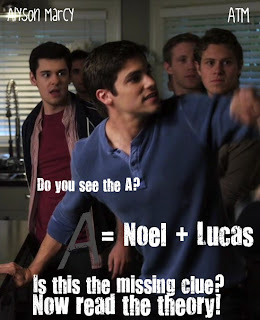 The first thing I'm going to post is my work-in-progress theory on the possibility of Noel and Lucas working together as "A" on Pretty Little Liars. It's a work-in-progress because it is solely based on what I have discovered by rewatching older episodes with the knowledge I have from the newer episodes kept in mind. And I'm no heroine but I want to save you. If you need a holiday from real. after I woke up in a car. as you told me all your dreams. Until I told you, "you can breathe." But it's not what it seems. And I won't make you cry.